If it weren't for her bushy tail and distinctly fox-colored fur, Vixey could pass for a dog. Footage of Vixey, a fox rescued from the fur trade in the Czech Republic, shows that sometimes foxes are closer to their dog cousins than we may think. … plus some very fox-like behavior as well such as nose-diving into the ground. As a fox living with humans, Vixey's caught between two worlds — part tame, part wild. While nature is certainly the best place for a wild animal, Vixey's never known what that's like. She was born into a factory that breeds foxes for the fashion industry, from which she was eventually rescued. 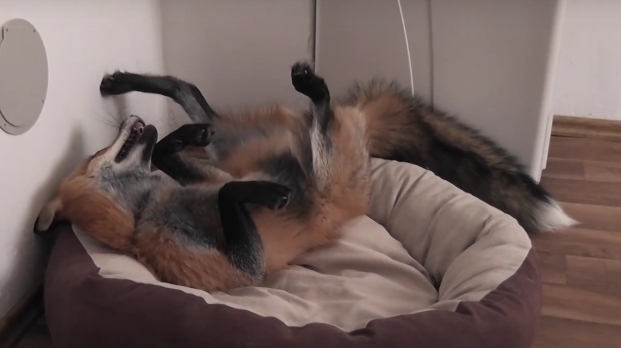 Happy Rescued Fox Loves to Play! Meet Vixey the fox! Vixey is a sweet Czech fox that was rescued from a fur farm. She looks so happy now! <3What an adorable ball of energy! :DSee more of Vixey at her personal website Vixey.cz. Responses to "Fox Saved From Fur Farm Is Pretty Sure She’s A Dog Now "